In a small saucepan, bring wild rice to a boil in salted boiling water, reduce heat to low, cover, and cook according to package instructions for approx. 35 – 40 min. Remove from heat and set aside. In a large, grease-free frying pan, toast peanuts over medium heat for approx. 1 – 2 min. until fragrant. Julienne bell pepper and red onion. Cut cilantro into thin strips. Cut mango flesh off pit, remove peel, and then cut into bite-sized pieces. 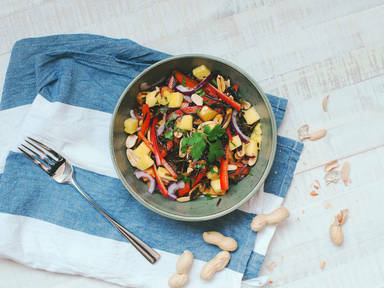 In a large bowl, combine mango, bell pepper, onion, cilantro, peanuts, rice, and soy sauce. Season to taste with salt and pepper. Enjoy!